grammar school teachers and friends. "May you never feel the color of this page." Because I attended Catholic school, I didn't have a six grade graduation like many of my neighbors. 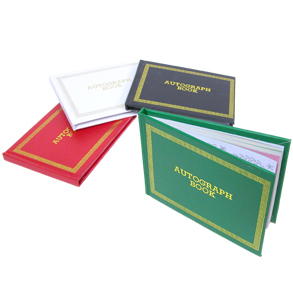 Too young for yearbooks, we were given little hard covered autograph books to capture memories of our final school days. The first pages of these books would allow you to include personal information. A page of favorites lists Stephen King as my favorite author, Goonies as my favorite movie and Serena as my best friend. I remember going through my mother's old things around that time. Mesmerized by her sixth grade autograph book and high school yearbook, I would curl up in my canopy bed and flip through them. I would read and reread her little navy blue autograph book. Each page was pretty pastel color, signed by my grandparents, uncles, great aunts, teachers and faceless young students she once knew. Oftentimes the pages would consist of poetic lines which weren't very personal. For example, I believe my grandpa signed a baby blue page. He didn't wish her good luck in junior high. He didn't congratulate her on completing grammar school. All he said was, "May you never be the color of this page, love Dad." When I received my autograph book, the exact same style and make of my mother's book, I noticed that my grandmother wrote me very similar wish about not feeling blue. Friends made jokes about The Monkees and wished me luck in high school. By the 1980s the poetic verses were no longer the popular thing the way they were in the early 1960s. 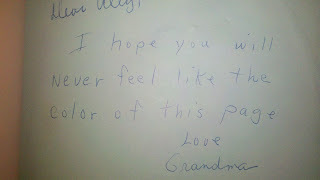 My grandma wrote this on a blue page of my autograph book. My grandpa wrote the exact same thing in my mom's book. 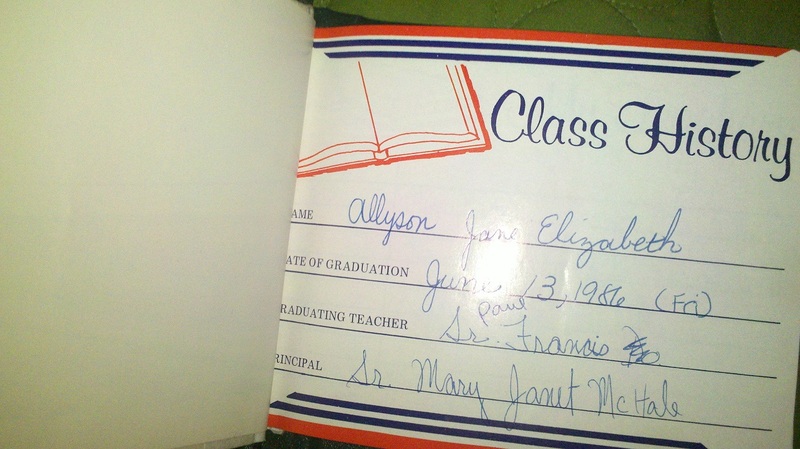 Did you have a book similar to this when you graduated from sixth or eight grade? We never had those since we always had year books. I think in my early days, we just expected to see each other all the time and autograph books weren't a necessity. LOL! 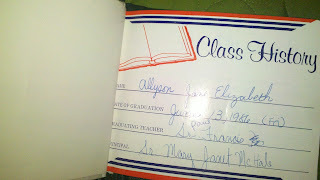 I had autograph books and so did my kids though they also had yearbooks. I wish I had kept mine. OMG you brought back such great memories! I had a Barbie autograph book but it wasn't for graduating 6th or 8th grade, it was for "just because"
I remember being 6 yrs old documenting the birth of my baby brother. I used mine as a diary at 6 yrs old! I never had one of these. I used to have a grade school yearbook for our 8th grade graduation and thought that I still had it only when I was looking through my storage totes couldn't find it. I must've accidentally thrown it out when I got rid of my grade school uniform and other keepsakes that I shouldn't have done this too. It's cool that you still have your autograph book!